Warsame Omar Muhamud has played the guitar for years and was a full-time musician in the Somali capital, Mogadishu, before he fled the fighting there and ended up at Dadaab refugee camp in northern Kenya. "I lost my wife and four children in the fighting," he told IRIN at Dadaab, 80 km from the Somali border. "They were killed by another clan in Mogadishu." At the camp, he spends his time playing a guitar provided by CARE, the relief organisation that acts as the implementing partner in Dadaab for the UN High Commissioner for Refugees (UNHCR). "I long to return home," Warsame, who remains confined to Dadaab along with other refugees, said. "My hope is that the new Somali government which was set up in Kenya in October 2004 will restore peace in my motherland." Fourteen years after thousands of Somalis fleeing a bloody civil war started arriving in Kenya, the refugees are growing cautiously optimistic about their newly appointed government and prospects for peace in Somalia. Baiynah Omar Hared, a Somali elder and community leader in the camp, told IRIN: "We have been here as refugees for 14 years […], it’s a very hard life. We welcome and appreciate any government established in Somalia. "A bad government is better than nothing," he added. "We want that government to be strong, and the international community to support it." 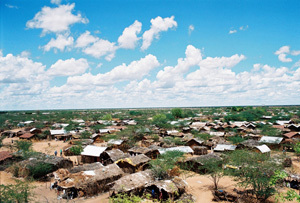 Dadaab is a town in northern Kenya located at the centre of the three refugee camps: Ifo, Dagahalley and Hagaderra. The camps, which are home to 140,000 refugees, are spread over 50 sq km of semi-arid desert, with sparse, thorny vegetation. Most of the refugees came from the southern regions of Gedo and the Juba River Valley in Somalia. Some came all the way from Mogadishu, almost 1,000 km away. The refugees like to keep abreast of developments and get most of their news from radio broadcasts. There are few television sets in the camps, and people can seldom afford the five Kenyan shillings (US $.06) the owners of cable-TV sets charge for an hour of viewing CNN or Sky News. Reception of local Kenyan television is poor. Still, the Somalis living in Dadaab have followed the current peace process closely, even though most have never actually seen the face of their new president, Abdullahi Yusuf Ahmed. Some blame the interim president and other faction leaders for the country's ills and argue that until they can agree on the way forward, no peace will come to Somalia. Abdulahhi Mohamed Gure, a camp elder, told IRIN: "The Somali war is based on clanism, but we are the same people, we are the same colours, we have the same language and the same traditions. "The only problem is the Somali warlords [faction leaders]," he added. "I do not think the Somali leaders will reach an agreement that will allow us to go home." Virtually all the refugees IRIN interviewed in Dadaab expressed their wish to leave the camps. A few, however, were under the impression that returning home would not be possible anytime soon. "We need the government to make peace before we return," an elder at Ifo camp told IRIN. "The government is not a clan - it has been elected by all the Somali people," he added. When reminded that the Somalis did not elect the current government, which was appointed at a meeting in Nairobi, he paused then added: "They voted in their hearts." [Kenya] Somali refugee children waiting to be registered at Dadaab. The younger residents of the camp did not display the same enthusiasm about the government. Mohamed Ahmed Mukthar, 22, who had spent more than half of his life in the impoverished camp, blamed the elders back in Somalia for the sorry state of a homeland he barely knows. "Some elders are even illiterate. We need to change them," he told IRIN. His friends nodded in angry approval. Mohamed Ali Harbi, an elder in Ifo camp, refuted this assessment: "It is the Somali youth doing the fighting, manning the checkpoints and trafficking things," he told IRIN. "To them, killing a person is just like squashing a tomato." Augustine Kambia, workshop coordinator for the National Council of Churches of Kenya, a consortium that is involved in the Peace Education Project (PEP), said there was a conflict between Somali generations in the camp. "The youngsters feel the elders let them down," he told IRIN. According to Kambia, there are three potential types of conflicts in the camp: clashes between Somali clans inside the camp, disputes between refugees and locals and quarrels within families. The PEP project is trying to use scenarios and enactments of simulated conflicts between refugees to defuse potential or existing feuds between residents. Camp residents said many conflicts tearing families apart were rooted in Somali traditions concerning early marriage and female genital mutilation. Young refugees, many of whom were raised or even born in Dadaab and have never seen Somalia, resist such practices while the old men insist on them, the residents said. Despite opposition, the weight of tradition in Dadaab is all too clear. Aid workers who register the refugees take identity photographs of everyone. One worker told IRIN that the women were often reluctant to unveil their faces for a photograph. "We need to see ears, eyes and hairline to identify them," the aid worker said. "It is especially hard if they are about to get married. They tell us: ‘How can I show you what I haven’t yet shown to my [future] husband?’"
Still, UNHCR insists on registrations, which are necessary to plan distributions and minimize fraud. "Voluntary statistics" – figures spontaneously provided to UNHCR by the refugees themselves – for the camps show many births and almost no deaths. UNHCR officials suspect that some families neglect to mention their deceased relatives, hoping to keep the ration cards and get more assistance than officially entitled to. 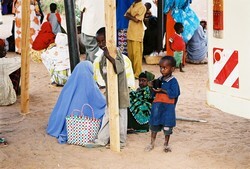 Ifo camp, Dadaab in Kenya where thousands of Somali refugees live. [Kenya] Ifo camp, Dadaab, northern Kenya where thousands of Somali refugees live. The UN World Food Program (WFP) distributes three kg of yellow maize per refugee every 15 days. There is no visible malnutrition, but many refugees complain about the food being different from traditional Somali staple food. "It’s not good. It’s carbohydrates," Mohamed Ahmed Mukthar told IRIN. Peter Smerdon, WFP spokesman, however, said: "We distribute yellow maize, which has the same nutritional values as white maize and largely tastes the same. The refugees say they prefer white maize because that's what they get at home, but we have to distribute what our donors give us." Within the camp, the general hardships of day-to-day life make the situation more exasperating. "It looks like donors are tired of Somalis - we’ve been here too long," Mukthar added. Residents said all three camps sometimes experience violence and insecurity. For example, residents avoid lighting kerosene lamps in their huts at night, fearing they will attract robbers. The adversity of refugee life in Dadaab adds to existing tensions. Emmanuel Nyabera, a UNHCR spokesman, said: "The refugee camp is situated in an area that is generally not safe, 80 km from the Somalia border. Thus cases of banditry are often witnessed. With the support of UNHCR, the government has beefed up security in the camp that has dramatically improved the situation." However, he added, insecurity still remained a challenge. "The Kenya refugee programme would do better with more funds," he said. "We are currently operating at minimum standards." The refugees in Dadaab flocked to Kenya after Somali former President Mohamed Siyad Barre’s regime collapsed in 1991. Various attempts to restore order in Somalia since then have failed. After the international community withdrew from Somalia in 1995, the country remained without an effective central government until reconciliation talks, held in Kenya over the course of two years, led to the establishment of a Federal Transitional Parliament in 2004. The 275-member parliament elected Abudllahi Yusuf Ahmed as president. The continuing turmoil in the country still pushes Somalis over the border with Kenya, notably towards Dadaab, where aid workers from the UNHCR receive them. Stuck in this arid land, Abdulkadir Ali, 25, summed up his plight: "I have no hope, but I still have ambition."